Use this two-page customizable press release template to help spread the word about your participation in EPA's 2015 ENERGY STAR National Building Competition. 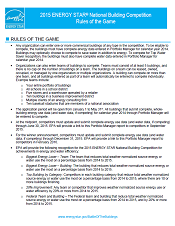 Learn the rules for competing in EPA's 2015 ENERGY STAR National Building Competition. This two-page document includes information about how to compete individually or as part of a team. Use these instructions to guide you through submitting property details to register for the 2016 EPA National Building Competition. This document contains data requests links to register for energy savings recognition, or energy and water savings recognition. Read these Frequently Asked Questions (FAQs) to learn more about EPA's 2016 ENERGY STAR National Building Competition: BOOTCAMP. This five-page document provides information on recognition opportunities, eligibility, teams, ENERGY STAR Portfolio Manager, the Data Release Report, and benchmarking and improving water efficiency. 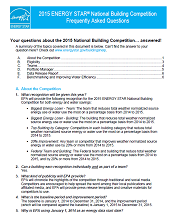 Learn the rules for competing in EPA's 2016 ENERGY STAR National Building Competition: BOOTCAMP. Use these materials to promote your participation in the 2016 ENERGY STAR® National Building Competition: BOOTCAMP! In this packet, you will find talking points, sample tweets, template news articles, template press releases, and more! This year’s Battle of the Buildings is a chance for organizations across the country to transform their buildings into lean, green, energy-saving machines in just 90 days—with the ENERGY STAR® National Building Competition: BOOTCAMP! Use the promotional materials in this toolkit to help spread the word! Encourage your members, clients, and contacts who own or manage buildings to join the fun and team up with ENERGY STAR to engage employees and occupants, and build a workplace culture of energy conservation.